the staff & writers are super nice. so flattered to be on their pages. 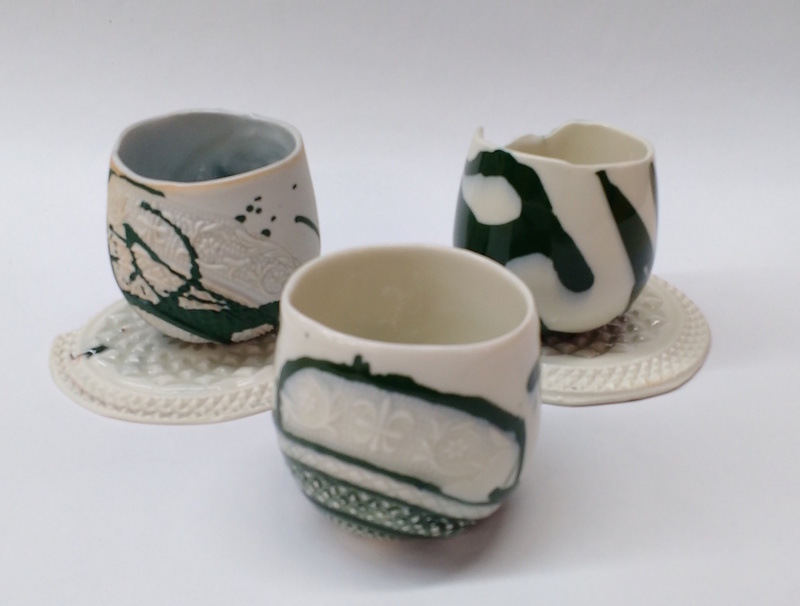 With their permison here's the article in full: originally published in March 2017 issue of Ceramics Monthly, pages 50,51,52. http://www.ceramicsmonthly.org . Copyright, The American Ceramic Society. Reprinted with permission. Wishing you and your families all the the best for the holidays and the New Year. and I appreciate it more than I can say. I hope you enjoy your goodies. 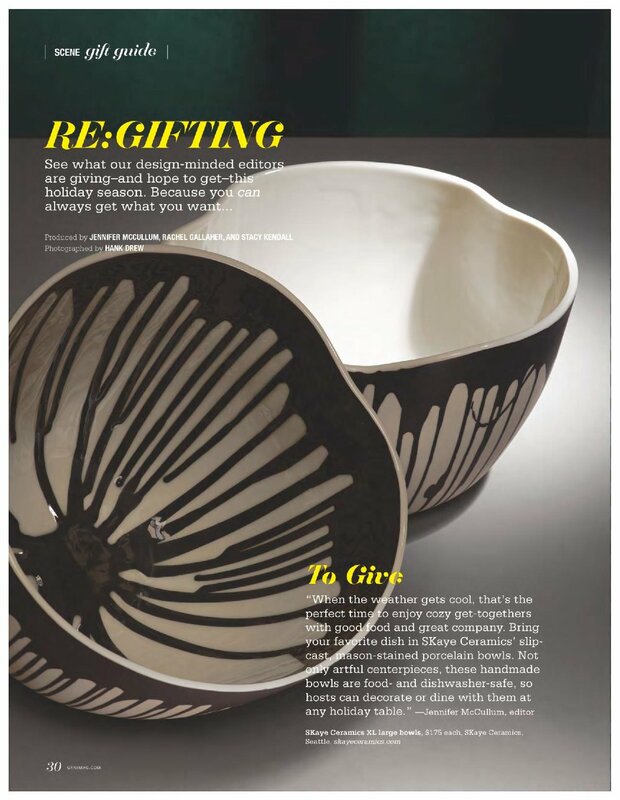 Here's the article I wrote for this month's for Ceramics Monthly. I very much appreciative their support and interest in my story, and I hope you enjoy reading it here, republished with their permission. For those of you paying close attention, the dog in the picture is Shelby, not Jones. Shelby is my "dog-daughter" a blond lab, and when her Dad used to travel for work she'd be with me in the studio. A few months before we got Jones, Shelby's Dad started traveling less, and so we made room for my new studio pup Jones. If you want to see him at work in the studio have a look here on instagram. my job just changed a little. Originally published in November 2016 issue of Ceramics Monthly, pages 36-39. http://www.ceramicsmonthly.org . Copyright, The American Ceramic Society. Reprinted with permission. Every Second Saturday of the month, Equinox's makers open their doors from 6-9pm for the public to come and adventure in art land. It's a different mix of makers every month, but always an adventure with fire pits in the street, and music and creativity pouring out the doors. You can also follow Equinox on facebook here - and they make an event every month and share who will be open, which is a nice way to follow a wider maker community. Stop by, and say hi - and give Jones a scratch under his chin he loves visitors! that's my bowl, in the Seattle Times. Thank you Seattle Times, Caitlin King, and the Universe. 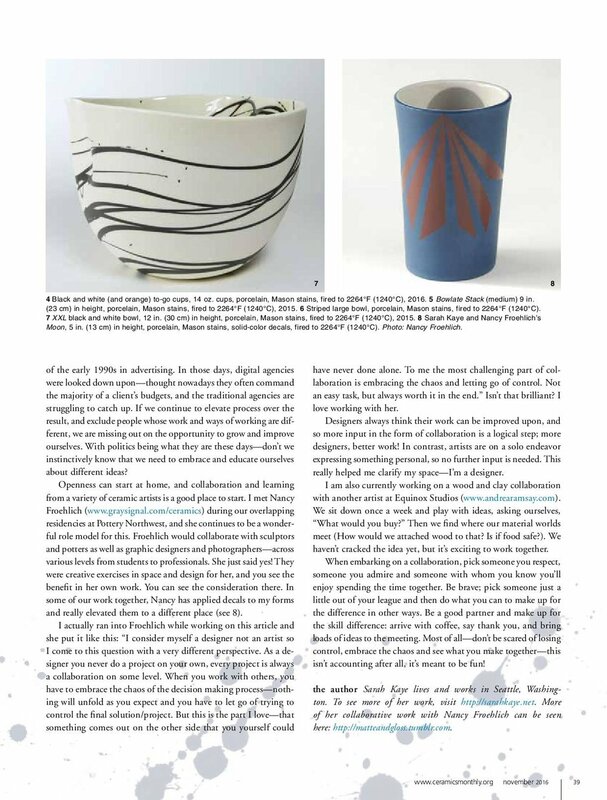 This Spotlight article was published in the February issue of Ceramics Monthly about little ol' me (!) 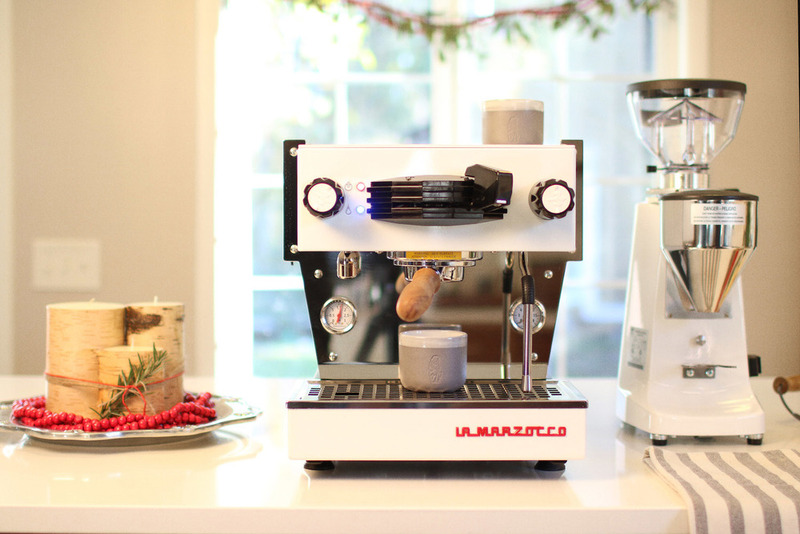 and my collaboration with La Marzocco Home. 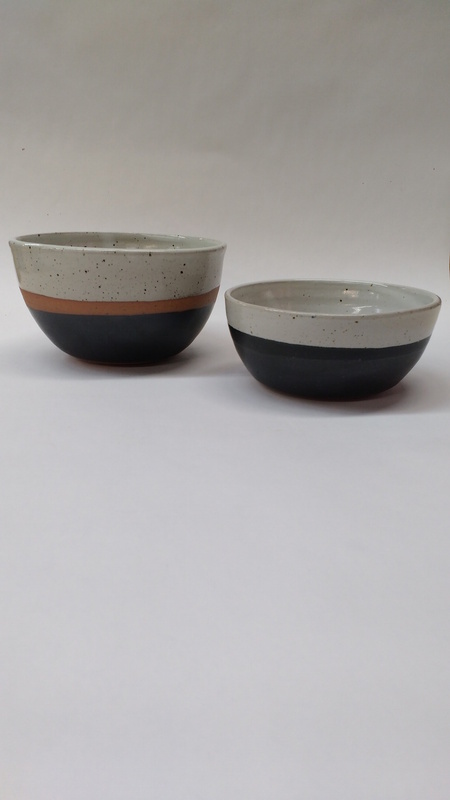 Thank you to Marcie McCabe (PR to Pottery Northwest) for the introduction, & thank you to Jessica Knapp (editor, Ceramics Monthly) for your interest in the project and your guidance. My brother & I grew up on two sides of the product design field - he is in tech, and I was the physical design stuff. We made a deal many moons ago that whichever of us made it into I.D. Magazine first, the other would buy them dinner at a restaurant of their choice. @Jofish - this isn't I.D. Magazine -- but it IS a full page spread. Do you want to settle up? Lastly, a grateful shout out to Kelly Ballantyne photographer extraordinaire, who made me smile, and managed a number of nice photographs of me in the studio that day. (This is no easy task, I grimace almost involuntarily at cameras.) I highly recommend her for ambiance portrait work - look how warm and inviting this photo is. Originally published in the February 2016 issue of Ceramics Monthly, page (80). Copyright, The American Ceramic Society. Reprinted with permission." The day after I signed for the keys to my studio at Equinox I took a call with Scott Callander at La Marzocco Home who was looking to source custom cups to be sold as accompaniments to their home espresso machines. He asked when they could visit my studio to talk in detail about the designs they were looking for, and I suggested Friday… giving me just enough time to sort the studio out, unpack boxes and build a few IKEA Omar shelves. When we met we hit if off right away, and afterwards I sent Scott along with a few schematic drawings and a note saying, “it was great to hang out”. 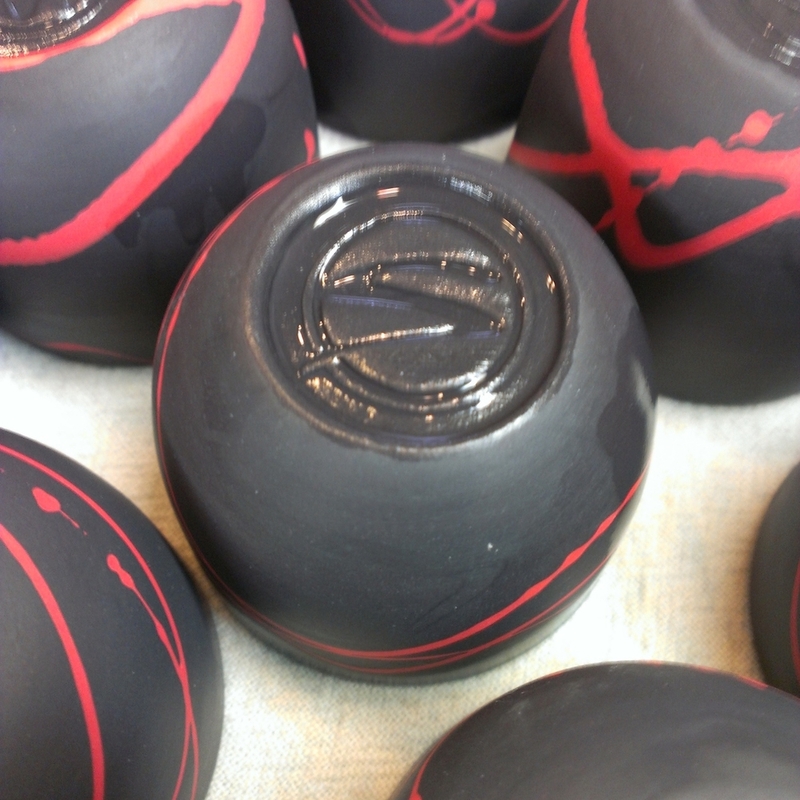 We went back and forth tweaking the design and having agreed on form, tone of grey, size of logo and glaze application – it was go time. Working with La Marzocco has been a gift. My lead client Scott, has been client, friend and mentor as my fledgling business is stepping up to the plate with a company well versed in supply, production and design quality. They are also well versed in social media and content production and Ben Blaze, creative & photographer extraordinaire, spent a few days at my studio documenting my process. He generously shared his photos from that time with me, here's a peak for you. 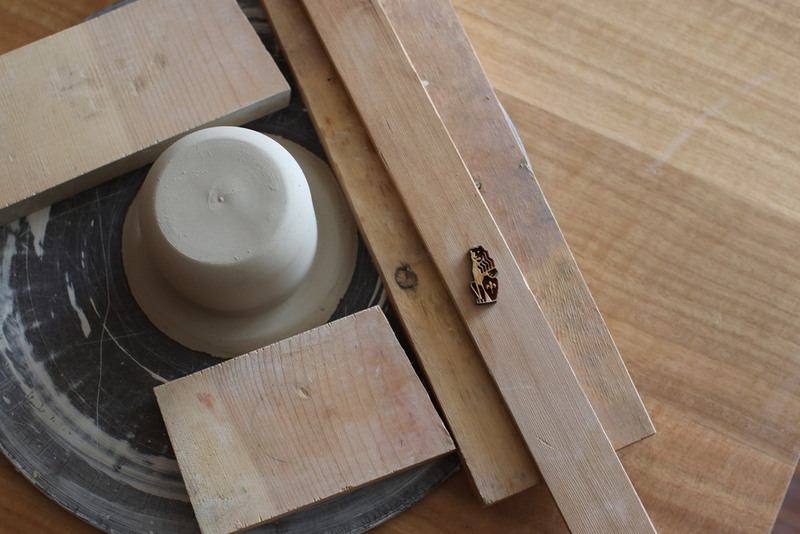 As I mentioned I will continue to teach at Pottery Northwest and I'm starting to understand how things work there. Residents get to propose their own classes and we've had coffee focused class, and another that had beer brewing as a focus - so there's lots scope to play with. After 2 years of watching some really talented people not giving themselves the permission to take their clay practice seriously - I wanted a class that had the structure I could really push my students with. The class I proposed and taught this time was called “up your game”. I was lucky to have a great mix of students old and new and they all took the challenge of the class seriously. They set themselves goals at the beginning of the semester and smashed past them, challenging themselves to try new things and put a little more effort and consideration into their work. It was really fun to teach the class and have the freedom to be ‘tough,’ calling my students out when they were cutting corners. As a bonus trickle on effect, while I always try to ‘up my game’ in my personal practice – teaching this class made me more aware in my own studio too. I am very proud. I only spent 3-4 hours a week with these projects, but at the end of 10 weeks – it feels almost as good as if they were my own. I’m reminded it’s a real honor to teach. Here are a few pictures of their work. After my exit show at Pottery Northwest I had to move out, (as the residency is only for 2 years). They have a lovely way of putting it, which is: it's not The End, we are just changing our relationship -- I will continue to teach there and be a part of the community. As a new home, I found myself a 300 square foot studio space at Georgetown’s Equinox Studios. EQ is bubbling over with creative people from blacksmiths and painters, to installation artists, costumers and a few clay folks too. It is a really friendly, warm community and there's always something bizarre happening. From forklift acrobatics, to three wheel trikes popping wheelies outside my window -- there's always a distraction. My first day in the studio I saw someone showing up at 5:25pm on a Tuesday afternoon, riding one of the community BMX with a fresh growler fill for the evening. It was then, that I was certain I knew I was going to like it here. If you are curious to know more, here’s a little thirty minute segment that aired on local TV just weeks after I moved in. You can see my hands at work about 2 minutes in, and there are a few ambiance shots of my studio space towards the end too. Actually, as this is my blog, I think I can take a moment to muse on the article. This was my first time dealing with the press about my own work. While it's a wholly a positive article, and lots of QA & MN readers visited the gallery and saw my show - it is not entirely how I would have told the story. There's something grating about the quote that my husband told me to get out the house -- out of the context of the conversation, it sounds less playful than how the story was told, and brushes my feminist sensibilities. But, "if there's no such thing as bad press" -- then hoorah! 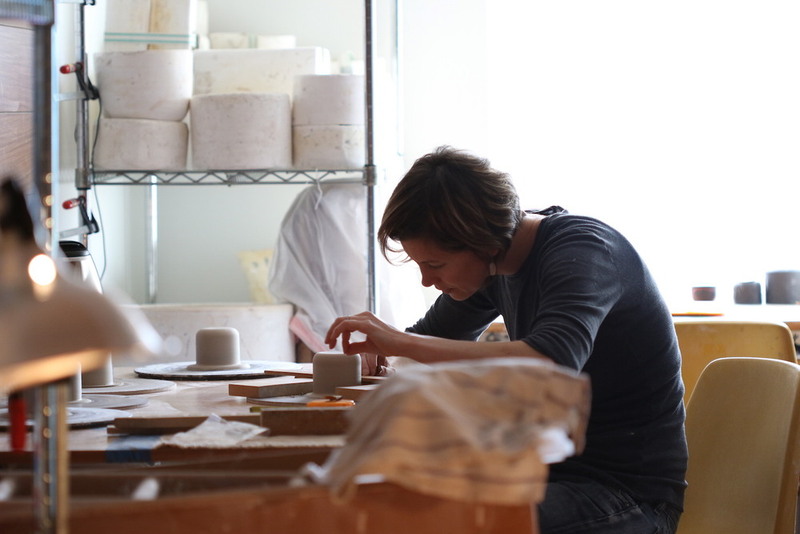 celebrating two years as a resident at Pottery Northwest. Below are some photos from the night of the opening. please do drop me a line - and I will happily meet you at the gallery to talk about the work. The show is up until the end of August. as there are so many people that supported me to this point. for being my photographers so I could focus on other things. to Jane Hill, transatlantic DJ. to Plank & Grain, for the generous loan of their handmade, furniture. found in old buildings around the Pacific Northwest. and I can't count the number of people who have raved about it to me since the show went up. 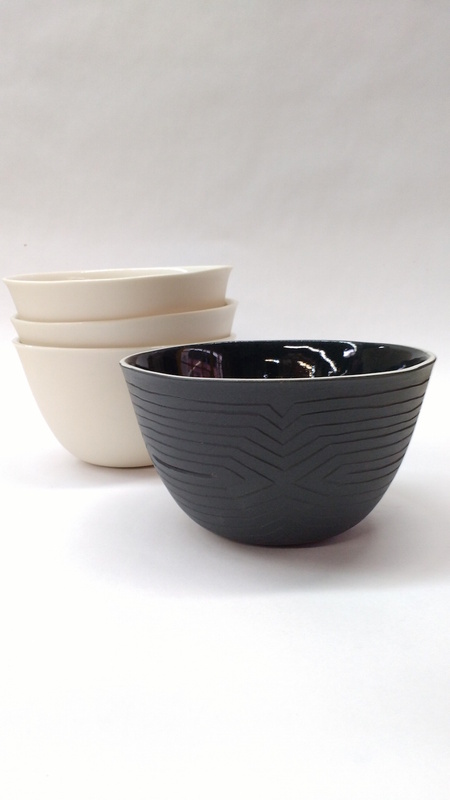 James Lobb director of Pottery Northwest, who truly enjoys facilitating artists making and showing their art. Only surpassed by his wife Brooke - who is the calm presence at each of our openings - and the person who makes everything alright on the night. They both follow elegantly in the footsteps of Wally & Julie Bivins who lead the way before them. Also, thank you to Wally for taking a chance on me, and all of your guidance, and friendship. Robert, Mum, Dad, Joe, Helene & Wolfe, Alex & Eileen, Bridget, Margaret & Chris, Janie, Ra&G, Vicky, Mel, Noriko, Momo, and all my friends and family who have believed in me, supporting my clay career from way back when - and patiently waited while I found my way back here. I could go on... it takes a village. Also, thank you to The Village. celebrating my 2 years as a resident. and now - back to work! I'll tell you more after the 7th. from someone who saw this photo on instagram. and my brilliant friend Jordan for the introduction to TLP. Also their post is timely! they are called: Gin and Tonic Please! In early February I had an e-mail via this website from Katy at Synesso a company that hand-builds high end espresso machines in Georgetown (Seattle). I knew of their machines from living in Melbourne, (shout out to Proud Mary!) In Auz - people cared about their coffee in way I've never seen anywhere else. Kit matters... I learnt that if you were grinding your beans in anything other than a conical burr grinder you might as well, not. So you got to knowing about the machines that made good coffee and Synesso was top of the list. They were looking for espresso cups, to give as thank you gifts to dealers to commemorate their first ten years in business. Specifically they wanted cups with a "clean aesthetic to parallel the precision in what we do." Which, is a compliment but also - scary, as it can be tough to get clay too 'precise' since its organic (and sometimes, temperamental!) but up for the challenge Katy, Sandy and I started designing together. Synesso had a few samples, one from a quite well known maker in California and I think the other was an East Coaster... they liked both designs - but really wanted someone local to make the cups. I met them with a few samples of my own - riffing off what they'd shared -- we played around making coffees in them, and seeing what worked and what didn't. The big thing we changed from my starting point was to round the inside of the cup. I've been working with sharper corners in my work -- which is a tell to my production method... but to get the most from your espresso you want to allow the crema to land gently and flow uninterrupted so it can maintain its texture, heat and bloom. So rounded it was... we tried a few shapes (see the inverted versions on the right) and looked at how they sat... on a table, in your hand, and still rounded itself on the inside. We could have kept the squared off exterior and then - using a two part mold - had a rounded inside. For two reasons this didn't appeal: foremost, I like the integrity or honesty of a one part mold - it looks like what it is, simple and straightforward. 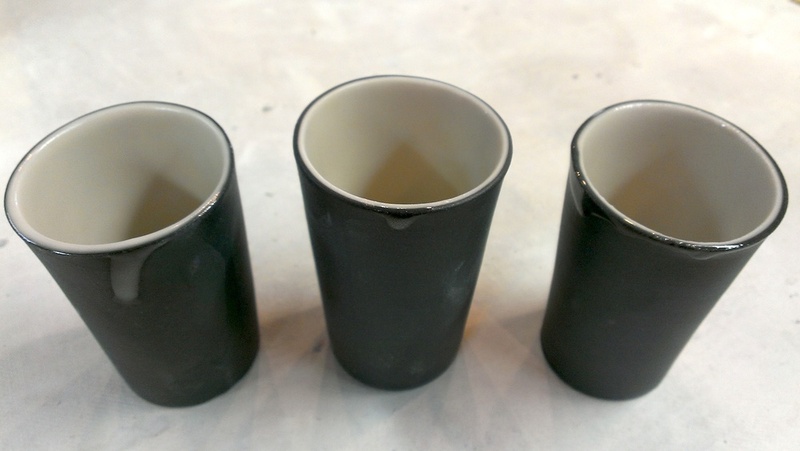 Secondly, we had a month to produce these cups, and I didn't want the additional time spent front end tooling a two part mold (and additional costs to the client) which would slow things down. I also made the cups really thick for Synesso. I mentioned earlier that clay is organic and sometimes (gasp!) 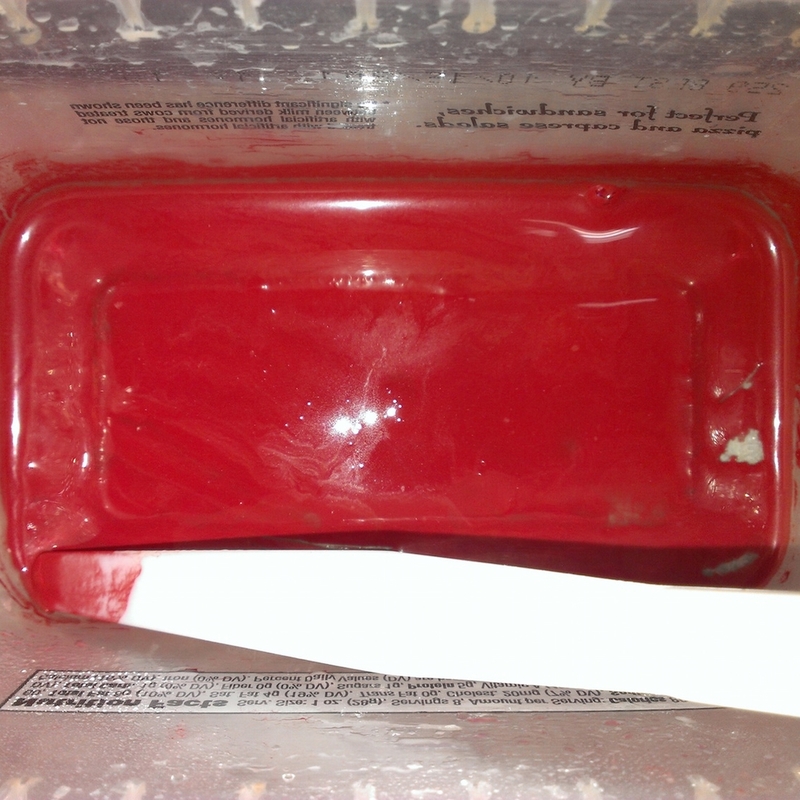 temperamental... half way through an easy day of casting my molds will do strange things (see picture on the left). Which has to do with the clay having an upset feeling... (Actually its more technical than that - as far as I understand its a flocculation issue ((which does come from overuse / neglect)) - maybe a post of this later for the clay nerds.) My point is, sometimes clay is hard to predict and control, so when Katy and Sandy casually wielded digital caliper to talk about size and thickness... I was a little nervous. Our aim was to produce a cup that didn't need a saucer, and could be handled hot off the machine with no discomfort which we got to. But I was very aware that makers of precision coffee machines weren't going to thrilled with an ish. Shout out to Alexa, my virtual assistant "Alexa, set a timer for 24 minutes," who kept the cups coming out an even thickness. I set about honing my red slip... to match Synesso's red branding. Testing two different mason stains at different concentrations in order to get a red that really pops. 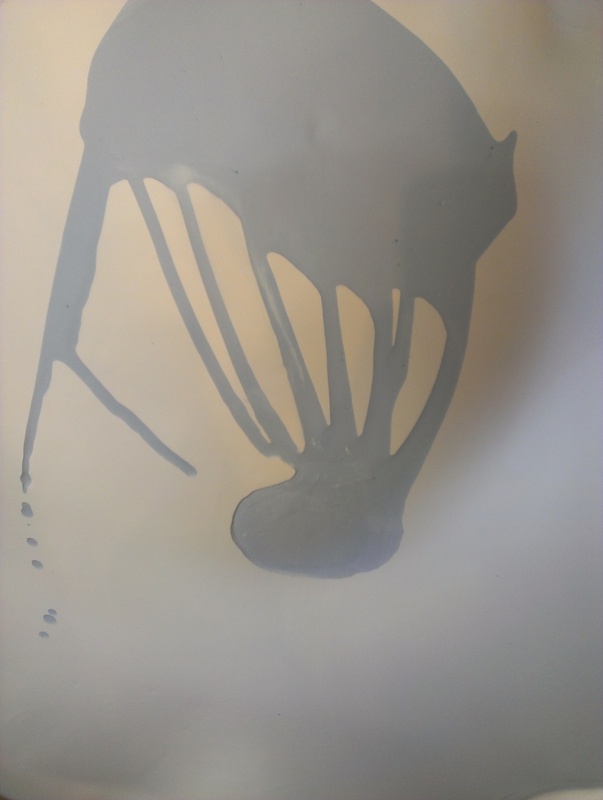 The photos below are the raw red stain mixed in water, the stain mixed with slip and the the first round of test colours. We went a second round, as we were looking for something really punch. In the end our concentration was at 15% stain to slip which is really high! (don't tell my students, I don't let them mix slip above 4%) The middle photo I think of as 'just for me' moment... I love watching the patterns bloom before it is mixed properly and have recently experimented a little with making work this way, but I'm pretty sure I was over tie dye before I became a teenager. The final step to resolve before I could make the molds was the logo - and I worked with metrix space using their laser cutters, laser etchers and 3D printers in order to develop the right stamp to put in the foot of the cup. 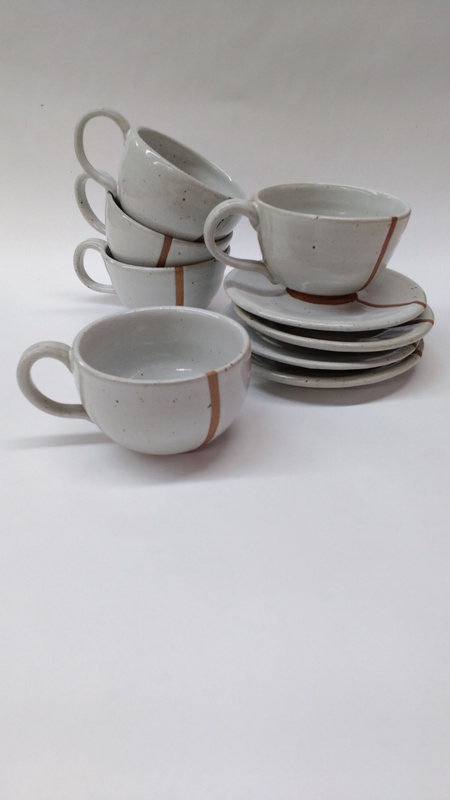 Large enough for the detail to be seen, delicate enough to not distract, and tapered in a manner that the cups would release from the design easily. I thought the best tool for the job would be the 3d printer -- but the detail was too delicate for the machine. 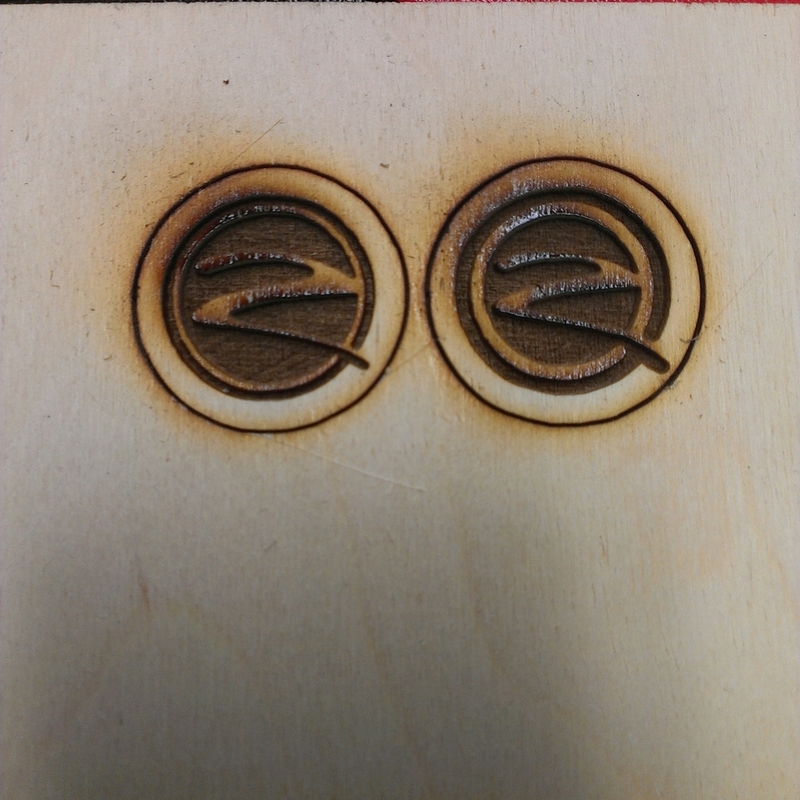 Next up was the laser cutter, but that's like using a chainsaw to julienne carrots -- and so: the laser etcher while a more expensive machine, is absolutely your friend in this situation. With the stamp made, I was able to move onto mold production -- everything is more efficient in numbers so throwing the 6 forms, then lubricating them, rolling out 6 fat coils to hold the metal cylinders in place... it is satisfying working in numbers. 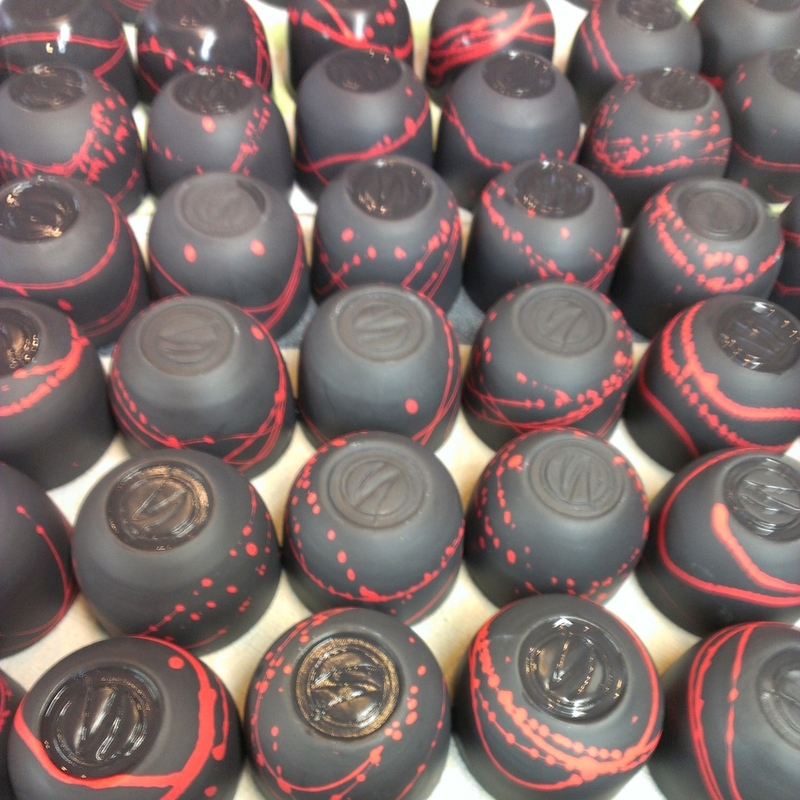 That's it really - shape, colour, volume... and then I set about making them. I think I made about 200 cups (I still need to do a final count for my own learnings) so as to ensure that I could deliver only the best pieces to Synesso. 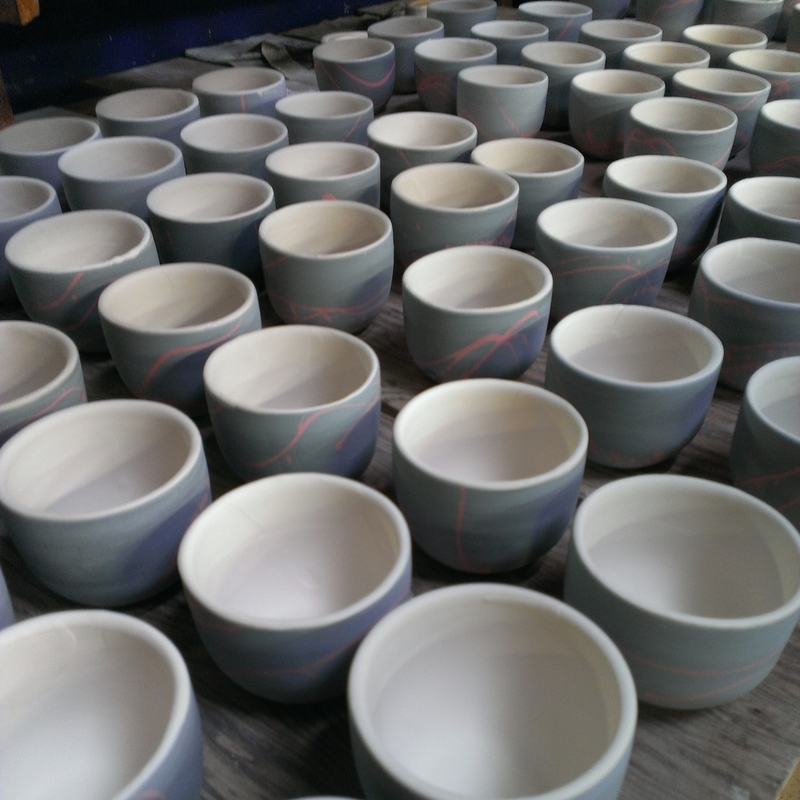 Working to the old business saying 'under promise and over deliver' I gave them a few more than 150, and a few larger cups with the same surface treatment to have around the office for everyone to enjoy. Thinking about it now, what I should have done was made them some dog bowls... Have you visited the Synesso offices?! They have the best collection of woofers in one office I've ever met... all amazingly well behave and friendly. I think with that, I should finish on a living, breathing Fraggle Rock Dog... Phyllis who I really am a little obsessed with. So the Monday after Salad Bowl still in a daze from the late nights (getting home after 1 am two nights in a row) and all the work that went into it… I get an email through via my website. Hi. My name is Scott and I am a Seattle-based food photographer. I am working on a shoot for Starbucks that requires 4-6 custom coffee mugs (without handles) - produced and delivered by August 26. Please let me know if you are interested and available and I can send further details. 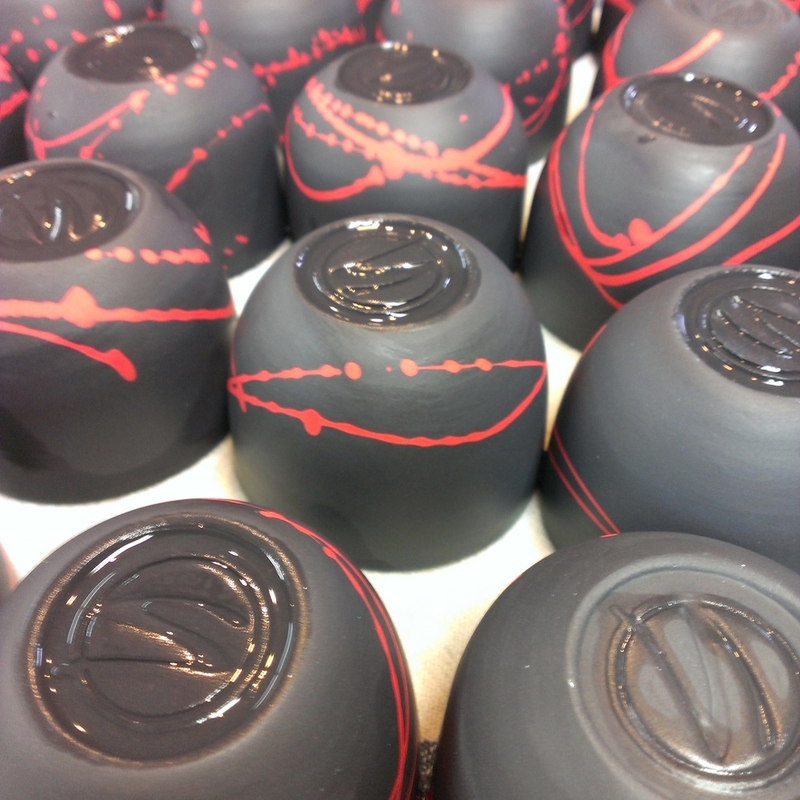 - Lastly, they wanted a satin finish glaze on the inside so it would behave under the photographer’s lights. which I'd originally thought I'd be doing for all my work - so had that in stock and tested too. The cherry on top was that the campaign was for a Flat White - & that’s my coffee!! Its how I drank my coffee in Melbourne – and I still try and order the same thing here which is always an effort “a 12oz latte with 2/3rds the normal amount of milk and no foam, please.” This is Seattle, and being specific about your coffee is okay - but even this is taking it a bit too far. I’m thrilled that its going to become a part of American’s vernacular! The campaign launches today in the US and Canada from what I understand – in every Starbucks. You know that just 13,000 (ish) stores with a picture of my cup in it! I'm don't think I believe in that "15 minutes of fame " thing - but if this is my 15 minutes, I'm thrilled. Thank you universe. Lastly, I don't think writing about this is complete - without say working with Scott had been a pleasure. He’s been a dream client. He gave me a very specific briefing, was interested in my process so that he could understand what the parameters are that we were working within… and was a champion of my work. He's also a really genuine guy. I couldn't have asked for more. Oh and final cherry on top of the cherry?! I was paid 4 days after submitting the invoice, and the check was cut on my birthday. I have to say, this project was probably the best birthday present. This set - tells me what's the other side of a piece. These are kiln loads, and unloads. 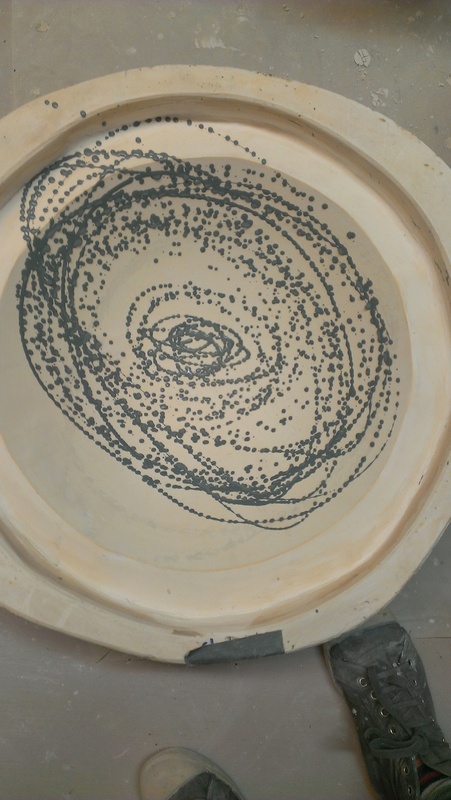 I love multiples - so when I've set a kiln to fire overnight, seeing these on my phone before I go to sleep almost excites me too much to sleep through the night. The kiln interior shots are useful for me to consider what fits the most pieces in for future efficiency.